Membrane roofing is a popular type of roofing for low sloped or flat commercial buildings. There are various materials that roofers use to build membrane roofs; two of the most common are EPDM and TPO. The full name of this roofing material is a mouthful, Ethylene Propylene Diene Terpolymer. Let’s stick with calling it EPDM. EPDM is basically a synthetic rubber roof made of ethylene and propylene. It comes in large sheets and roofers have a few options for attaching it. They can glue them down, attach them mechanically, or hold them in place with a heavy ballast material like gravel. It only comes in a dark color, which can be an advantage in cooler climates because it absorbs heat. In hotter climates, it may cause your cooling bills to be higher. TPO or Thermoplastic Polyolefin is a newer but similar type of rubber membrane roofing. Unfortunately, as a newer material, there is less long-term data on the durability of these roofs. This particular roofing material was designed to address some of the common issues with EPDM roofs. TPO reflects sunlight and is chemically adhered. It comes in a variety of colors and, in general, costs close to the same as its EPDM counterpart for material and installation. All-in-all, TPO has quickly become one of the most popular commercial roofing options. Metal roofing is another popular option for commercial buildings. Roofers can use it in a variety of situations: from low sloped roofs to very sharply sloped ones. Building codes in your area may dictate which type of metal is best for your roof, but choice is not limited, since this roofing style comes in several different metals, including tin, aluminum, galvanized steel, zinc, and copper. People love metal roofs because they look sharp, last a long time and require little maintenance. They require a bit more of an upfront investment, but this often pays itself back in longevity and lower maintenance costs. There are various types of asphalt roofing that commercial buildings can use. The two main categories are built-up roofing (BUR) and modified bitumen systems. Asphalt roofs consist of several layers. There is usually a weather-proofing layer, an insulating layer, a membrane, and a top layer to finish it off. Because of all these layers, asphalt roofing is durable and very resistant to leaks. Asphalt roofs don’t have longest lifespan of all the roofing material options out there, but when installed correctly, they can last for decades. Additionally, its moderate upfront cost makes it a good option when you have to be budget-conscious. Now we’re getting back to basics. People have been using natural slate and tile roofs for thousands of years. Slate is quarried and tile is fired and shaped into handsome, durable shingles. Natural slate and tile have an extremely long lifespan, around 150 years or so for slate and 100 for tile. You can also get synthetic slate and tile, but they tend to only last around 50 years or so. A slate or tile roof might be a snazzy option, but it comes with a snazzy price tag. Plus, you may have to put even more money into reinforcing the structure of the building for it to be able to handle the weight. On the other hand, asphalt or membrane type roofs offer a great value without compromising too much on durability.Having a hard time choosing the best commercial roofing material? Feel free to contact us today! 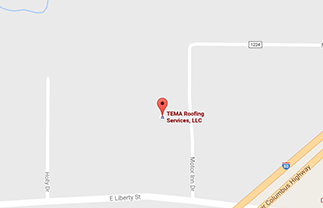 We can answer your questions and help you with all your commercial roofing needs.